In many of his Black paintings, including Untitled [black painting with portal form], Rauschenberg layered the canvas with pieces of scavenged newspaper that ranged in size from small scraps to entire sheets (fig. 3). This gesture represented a clear reworking of aspects of the abstract expressionist painterly vocabulary7 and also emphasized his interest in both the texture of the canvas and its structural mediation through the everyday materiality of a disposable item. When coated with paint, the cheaply produced newsprint buckled, creased, and roiled in unpredictable ways, effecting a highly variegated, slightly shimmering surface that caught the shifting light and shadows of its environs and produced an elegant study in the interrelated categories of “structure, texture, and facture”8 emphasized by Albers. The brilliance of Untitled [black painting with portal form] is that one can simultaneously appreciate the artist’s complex handling of paint across an array of uneven surfaces while acknowledging the ways that the artwork, in its use of newspaper as a formal and almost sculptural element, bridges painting, collage, and assemblage. The work offers up a new understanding of painting as wholly engaged—and in active, embodied dialogue—with its environment. In Rauschenberg’s hands, the newspaper acts as a parallel to painting in some ways and as a collage element in others. As such, the painting functions much like a translational document, a mediating step between Rauschenberg’s earlier concerns with the receptive potential of monochromatic surfaces, most clearly exemplified in the White Paintings and his subsequent Combines (1953–64), hybrids of painting, sculpture, collaged paper, and found items that knowingly bridged the vertical space of the canvas with the world of the viewer. Rauschenberg selected newspaper not for its text or images but rather for its material factness, a quality John Cage (1912–1992) described as the artist’s “third palette.”9 The shape of an unfolded sheet of newspaper—a rectangular grid comprising four quadrants—seems to anchor the composition and dictate the overall flow of the other forms that populate it. The productive tensions between an abstract expressionist engagement with surface, paint, and gesture and a more decisive shift into the ambiguous terrain between painting, collage, and assemblage find their fullest expression in Untitled [black painting with portal form], specifically in the way the composition is structured around (and then decisively proceeds from) a tonal, monochromatic center: a flat, inky, double-truck sheet of newspaper. In what one may call the painting’s melodic “theme,” this form is in turn echoed and inverted in its adjacent “variations,” three regions that, in an aggressive improvisation on the structural unity of the central organizing principle of the canvas, respectively reveal more (or less) actual newsprint than the central black rectangle. Like Rauschenberg’s Elemental Sculptures, which were meant to be manipulated and can be installed in various positions, Untitled [black painting with portal form] can be hung either horizontally or vertically, tempering the viewer’s corporeal relationship to a large, imposing, matte black form by rearranging the compositional field.10 When the work is displayed horizontally (fifty-four inches wide by fifty-one inches high), the rectangular center of the painting is vertically positioned, suggesting a uniformly darkened doorway, window, or portal. In this “landscape” format, the portal is more recognizable as receding ground, surrounded by its mottled environs. When the painting is rotated ninety degrees, this form then assumes a more horizontal position and reads less like an opening, more frankly acknowledging its literal correspondence to a sheet of newspaper. 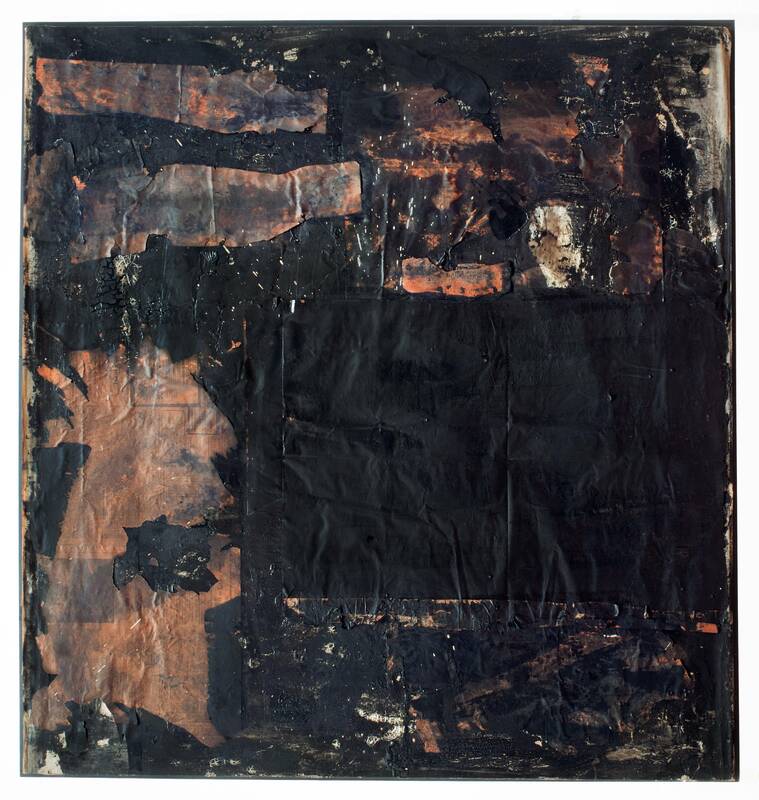 Because Rauschenberg employed different kinds of black paint—matte, glossy, flat—one may rightly interpret Untitled [black painting with portal form] and its variants strictly in terms of patina: to speak of a slow curing of the thick paint; of a field of many shades of black; of a blistering landscape riven with crests and valleys, cracking to reveal the occasional presence of white and gray pigment. With the artist’s subtle use of different shades of paint, as well as his careful attention to the variegated surface of the canvas, the painting stands as a successful intervention into the terrain of abstract expressionist painting. Within a year of completing Untitled [black painting with portal form], Rauschenberg began to engage the textual content of his materials more overtly, adding words and a variety of printed material to his compositions, thus emphasizing a direct relationship to the media-saturated landscape and the world at large. With many of his paintings from 1951–53, the artist explicitly acknowledged the historical weight of the monochrome yet deftly pushed beyond a mere rehearsal of its formal concerns, alluding subtly to the increasingly porous borders of the modernist canvas and its implied sanctity. That these gestures are simultaneously legible in Untitled [black painting with portal form] is a testament to its significance, both in the immediate context of Rauschenberg’s work of the 1950s and as a forecasting of the experimentation and blurring of artistic boundaries that would follow in its wake. The exhibition, Rauschenberg: Paintings and Sculpture; Cy Twombly: Paintings and Drawings, ran from September 15 to October 3, 1953. One of the most definitive accounts of the Black paintings and Rauschenberg’s work from this era is Walter Hopps, Robert Rauschenberg: The Early 1950s (Houston: Menil Foundation and Houston Fine Art Press, 1991); see, in particular, 66–71 and 152–54. This painting was dated 1952 in its first publication. See Rauschenberg: The White and Black Paintings 1949–1952 (New York: Larry Gagosian Gallery, 1986), n.p. The date was changed to 1952–53 by Walter Hopps based on research for the exhibition and catalogue Robert Rauschenberg: The Early 1950s, 152–55. Hopps cites scraps of newsprint dated October 1952 (ibid., 176). However, recent visual inspection has confirmed that the clippings are actually from 1951. Clippings dated October 8, 1951, October 9, 1951, and February 28, 1952, have been identified; no clippings dating to 1953 were found. Rauschenberg may well have used newspapers collected in fall 1951 for works begun in early 1952, or he may have started the painting earlier than previously believed. The painting would benefit from X-ray analysis, but such analysis has not been possible in the course of this project. The Black paintings were completed in two phases. The first group is believed to have been completed at Black Mountain College in 1951. The second group, begun at Black Mountain in 1952 before Rauschenberg’s travels with Twombly, was completed in New York upon his return in 1953. The selection of Black paintings shown at the Stable Gallery in 1953 included some from each phase. See Hopps, The Early 1950s, 152–54. 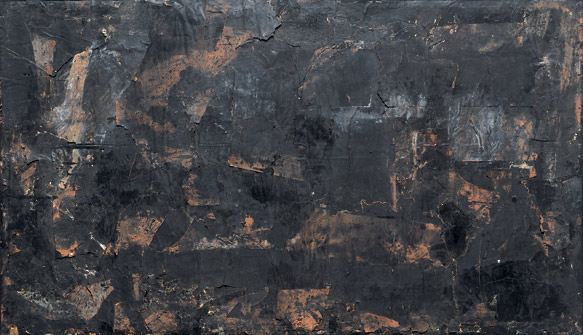 The other Black painting featured in this project, Untitled [glossy black painting], is thought to have been completed at Black Mountain College in 1951. As a frequent visitor of New York galleries in the early 1950s, Rauschenberg was well acquainted with the work of all three. See Susan Davidson and Joan Young, “Chronology,” in Robert Rauschenberg: A Retrospective, ed. Walter Hopps and Susan Davidson (New York: Solomon R. Guggenheim Museum, 1997), 551. Rauschenberg later explicitly acknowledged his regard for Kline and de Kooning. 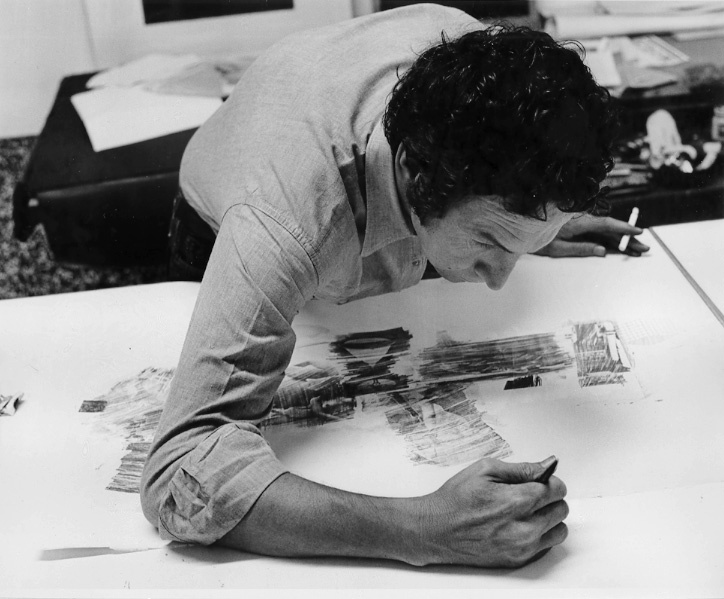 See Robert Rauschenberg, Oral History Interview conducted by Dorothy Gees Seckler, December 21, 1965, Archives of American Art, Smithsonian Institution, Washington, D.C., accessed June 7, 2013, https://www.aaa.si.edu/collections/interviews/oral-history-interview-robert-rauschenberg-12870#transcript. Robert Rauschenberg, quoted in Emile de Antonio and Mitch Tuchman, Painters Painting (New York: Abbeville Press, 1984), 88. Rauschenberg’s student transcripts from Black Mountain College indicate that he took Albers’s color course in spring 1949. At the time of their showing, Dore Ashton described some of the Black paintings as “black beasts, with amber overtones and black enameled paper fluttering on their battered surfaces.” Dore Ashton, “Fifty-Seventh Street: Robert Rauschenberg,” Art Digest 27, no. 20 (September 1953): 21, 25. Further, in a 1965 interview, Rauschenberg recalled that critics and the public alike first looked for meaning beyond the formal properties of the color: “they immediately moved into associations and the associations were always of destroyed newspapers, of burned newspapers.” In comparing his paintings from the early 1950s to contemporaneous trends in Abstract Expressionism, Rauschenberg continued: “There was a whole language that I could never make function for myself in relationship to painting and that was attitudes like tortured, struggle, pain. And I never could . . . I don’t know whether it was from my Albers training or my own personal hangup, but I never could see those qualities in paint.” Rauschenberg, Oral History Interview with Dorothy Gees Seckler, December 21, 1965, https://www.aaa.si.edu/collections/interviews/oral-history-interview-robert-rauschenberg-12870. For further discussion of Rauschenberg’s engagement with Abstract Expressionism, see, for instance, Hopps, The Early 1950s, 66–67. This phrase, frequently cited in the Rauschenberg literature, derives from Albers’s highly systematic Werklehre, an interdisciplinary focus on media first developed in the Bauhaus in the 1920s. See, for example, Josef Albers to Alfred Barr, telegram, “On Structure, Facture, Texture,” November 26, 1938, Papers of Josef and Anni Albers, “Correspondence with Institutions and Organizations,” box 81, folder 12, archive at The Josef and Anni Albers Foundation, Bethany, CT.
“As the [black] paintings changed the printed material became as much of a subject as the paint. . . . The atmosphere is such that everything is seen clearly, even in the dark night or when thumbing through an out-of-date newspaper or poem.” John Cage, “On Robert Rauschenberg, Artist, and His Work,” in Silence: Lectures and Writings by John Cage (Middleton, CT: Wesleyan University Press, 1973), 99. In an interview conducted by Walter Hopps in preparation for his 1991 exhibition Robert Rauschenberg: The Early 1950s, Carolyn Brown, the work’s first owner, recalls being troubled by the large black rectangle when she first saw the work at Stable Gallery, New York, in fall 1953. In response, Rauschenberg suggested that they hang the painting on its side. From that point on both orientations (horizontal and vertical) have been acceptable. Carolyn Brown, telephone interview by Walter Hopps, January 22, 1991; edited transcript prepared by Brown for the Exhibition History Files, Menil Archives, the Menil Collection, Houston. 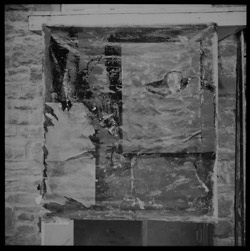 Cite as: James Merle Thomas, “Untitled [black painting with portal form]”, Rauschenberg Research Project, July 2013. Cite as: James Merle Thomas, “Untitled [black painting with portal form],” Rauschenberg Research Project, July 2013.